Specifically, the brief to our team at Realm Building Design was to design a space that combined beautiful homewares for purchase with a place to catch up with friends and share gourmet cakes, food and barista-style coffee. Janine and Stephen had been involved in retail before, in a number of businesses, and had firm preferences and ideas around functionality and style, and we knew we had to deliver a simple, unconstructed and easy space to work in — with a hint of industrial appeal. Working within a historic building in the heritage-listed Port of Echuca Precinct was an exciting challenge for our team and collaborating with Janine and Stephen and their team of expert trades was key to the stunning end result. Stephen explains: “working together, in collaboration (with the Realm team), was so important to the success of the project”. “We are so pleased with the end result… its ambience and its appeal… this building is so unique and it was important for us to highlight its many features,” Stephen says. “And we could not have achieved anything like this without the assistance of Janita… we had the vision and the Realm team helped us deliver it,” he said. Janine and Stephen had worked with Janita in the past and they were confidant we would have the ability to fulfil the visions they had for The Nook. “Janita listens to her customer’s needs, and cares about the vision you have for your home or project… why would we go anywhere else?” Janine asks. Many of the ‘hero’ features of The Nook project are a nod to the history of its location on historic High Street Echuca — just a stone’s throw from the heritage-listed Port of Echuca. Features such as exposed brick and the structural bones of the heritage building have been retained to create a grand but intimate mood — quite the feat in a new build project which houses both a café and a retail space. The build team, including Brendan Kelly Cabinetry and young local builder Daniel Oberin, worked hard to incorporate recycled and repurposed materials, including old pallets on the back wall and reclaimed timber from the Boort High School for the front service counters. The original internal framing of the 1883 building has been used, fitted with cabling and hanging globes for an industrial feel and is undoubtedly the hero of the building, acting as a modern-day chandelier. Marrying the two ‘modes’ of café and retail at The Nook was a careful consideration on the build; adequate bench space was installed to properly cater for coffee and cake, as well as professional retail shopping. The two modes work in harmony together thanks to many hours of research and experience in and around retail on Janine’s part. Janine explains there were many aspects to consider to ensure the café and retail space complemented each other and she is overwhelmingly pleased with the end result. “It is a warm and welcoming space that I feel really proud of,” Janine says. “The process was really rewarding… watching it evolve and how it was just worked and then came together for a stunning result,” she says. Since opening only three years ago, The Nook has become a firm favourite for both locals and visitors to Echuca Moama and many customers comment to Janine and Stephen how they appreciate the high standard of customer service they always receive and also just love spending time in such an inviting and beautiful space. The industrial but cosy space that has been created at The Nook by Janine and Stephen, with guidance from our team at Realm, has been a huge success and highlights what can be achieved when you collaborate with the right people who have passion and dedication for what they do. 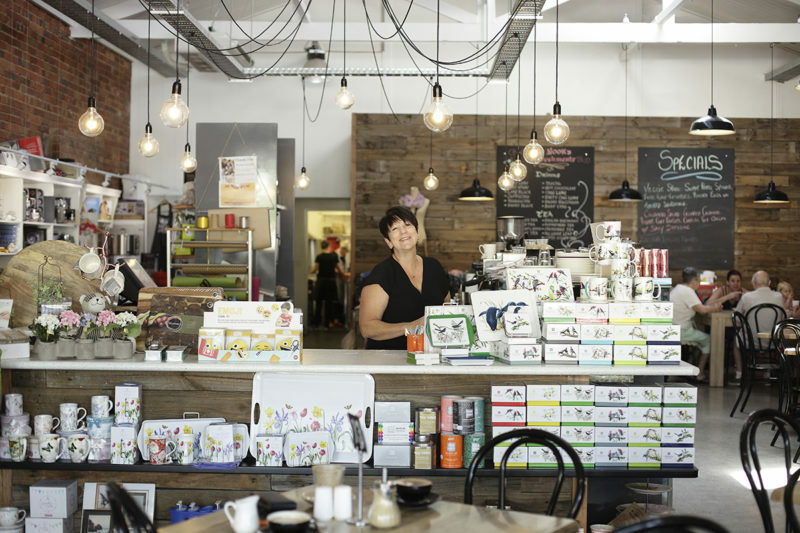 The Nook on High is open seven days a week and is located at 542 High Street, Echuca.